R.E.G.R.E.T. 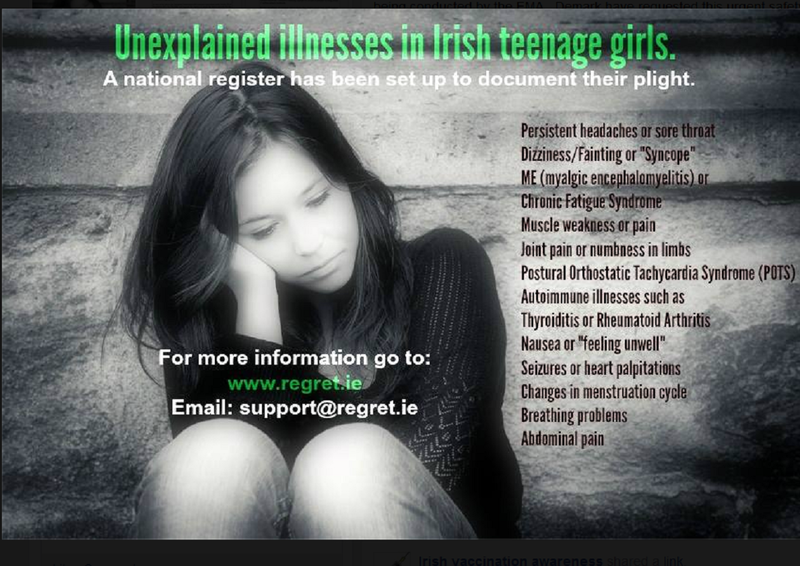 Support Group was set up by parents of Irish teenage girls who have developed serious health problems after entering secondary school. These parents are certain that the HPV vaccine (Gardasil) is the cause of their daughters' otherwise unexplained illness. The primary goal of the parents in the group is to get help for their daughters who, like many girls around the world, have experienced "Reactions and Effects of Gardasil Resulting in Extreme Trauma" (R.E.G.R.E.T). Many are not receiving effective medical treatment and cannot attend school regularly due to the debilitating health conditions they still suffer from. Just as important to these parents is to raise awareness of the safety issues surrounding the HPV vaccine so that other parents can be in a position to make a truly informed decision on this issue. The group feels that the information provided by the HSE is incomplete and biased, downplaying the safety issues while exaggerating its effectiveness. "Our Girls Are Not Rumours - Getting Help after HPV Vaccination" (2018, Ireland). Produced by REGRET Support Group. HPV Vaccine injury protest in Dublin as Prof Ian Frazer, co-inventor of the vaccine, gave a speech next door at the Royal College of Physicians. During the protest 2 girls collapsed with seizures and had to be rushed to hospital (09/07/2018). "The Current Status of Worldwide Injuries from the HPV Vaccine"
Anna Cannon of REGRET speaking at international symposium on "The Current Status of Worldwide Injuries from the HPV Vaccine" held in Tokyo on 24/03/2018 with Medwatcher Japan. "HPV Vaccine, An Irish Experience"
"HPV Vaccine, An Irish Experience" - Peter Hollidge, IFICA Conference, Dublin (21/04/2018). Four Irish families tell their stories about what getting the HPV Vaccine Gardasil has meant for them. TV3 documentary aired on 14/12/2015. Anna Cannon from REGRET speaks to Irish Parliament Committee. Karen Smyth from REGRET speaks to Irish Parliament Committee. RTE News Report on falling uptake of HPV Vaccine in Ireland . George Hook challenges Irish medical experts on HPV Vaccine safety [04/10/2016]. [14/12/2015] Interview on Pat Kenny Show with mother and her daughter who suffers serious longterm illness which she says was triggered by the HPV Vaccine Gardasil. Also debating the issue was REGRET Spokesperson Anna Cannon and a Consultant in sexual health who is not convinced of a link. [07/04/2016] NewsTalk interview family of Rebecca, 15, who suffers serious longterm illness which she believes was triggered by the HPV Vaccine. Also debating the issue is Dr Ann Hogan, vice president of the IMO, who is not convinced of a link. Question on HPV Vaccine serious reactions for Minister for Children James o'Reilly, who advocated strongly for the introduction of the Vaccine. However he failed to appear for the Q&A sessian on Tv3's Vincent Browne show 13/01/2016. Irish Senator Paschal Mooney highlights REGRET.IE, and states "The medical profession are protecting the pharmaceutical companies by denying there are any side effects"
Irish Mother (representing herself) takes case against Health Product Regulatory Authority seeking injunction to suspend the HPV vaccine which she believes is responsible for her daughter's illness. Fiona Kirby gives her first radio interview after her HPV Vaccine court case. REGRET calls upon Minister to reconsider proposed increase of Disability Allowance age threshold. Senators and TDs express shock after meeting REGRET Parents in Dáil Éireann. SanityCheck: How Proven are HPV Vaccine Benefits? Informing the Crowd - How the HPV Vaccine was sold to a credulous Irish public. 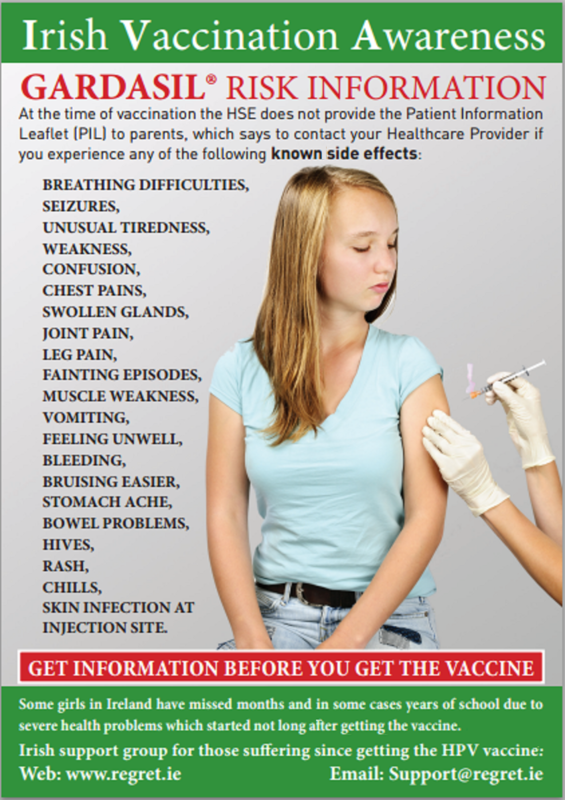 Competing information campaigns launched as HPV vaccine program recommences. Support Group R.E.G.R.E.T. offically launched in Swords. Irish Adverse Reaction Reports for the HPV Vaccine Gardasil more than all other vaccines combined (for girls). 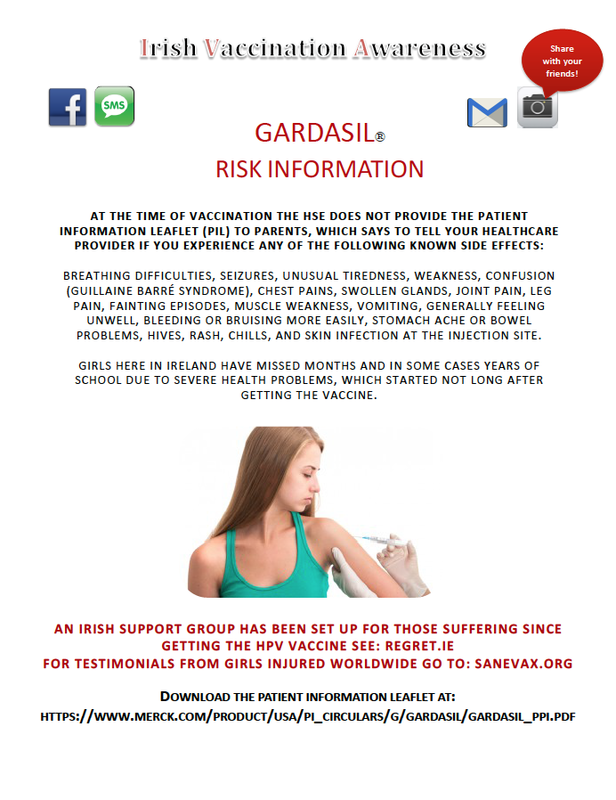 Regret.ie investigates very rare blood disorder reported after gardasil vaccination (3 cases reported In one week). Caoimhghín Ó Caoláin TD, Sinn Féin Spokeperson on Health. United States: Sanevax.org, Facebook Group.